The capital of Tibet is also home to the most important civil and religious buildings. 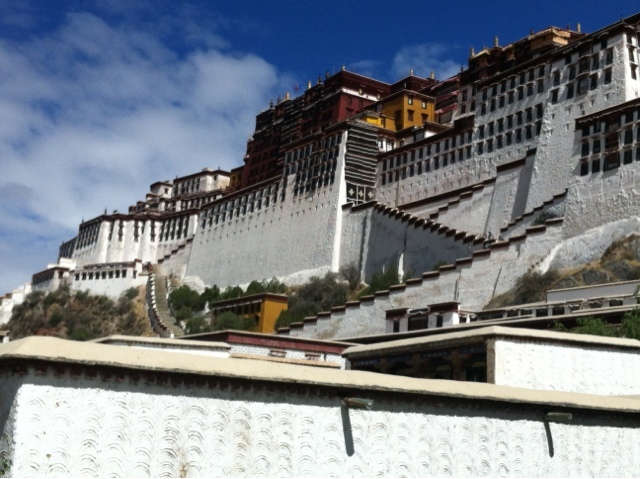 The Potala Palace was built in the seventh century as the winter home for the Dalai Lama. An imposing building on an isolated hilltop said to resemble an elephant's back, it is now surrounded by the sprawling city. Inside the brilliant colours are lit by yak butter lamps. The stupa tombs of previous Dalai Lamas are coated in up to 4000kg of gold and precious gems. The overall effect is however, stifling and primitive. The parallels with the selling of indulgences and the promise of salvation through deprivation of the medieval church are overwhelming.